Well, here it is. I Declare War is the best movie I saw at the Chicago Critics Film Festival and one of my favorite movies of the year. The premise is simple: two groups of 13-year old boys (and one girl) spend an afternoon in the woods playing war with one another. They use sticks for guns. They use paint-filled balloons for grenades. The rules are few: if you are shot, you have to freeze and count to 10 before you can reenter the game. If you get hit with a grenade, you're out. Go home. The game ends when one side captures the flag from the opposing team's base. Leading one side is PK (Gage Munroe), a small, long-haired boy obsessed with military strategy (his favorite movie is Patton) and holding an undefeated record. He has met his biggest challenge ever in Quinn (Aiden Gouveia), a smart, cunning preppy kid acting as general for the first time. On PK's team is his best friend Kwon (Siam Yu), Joker (Spencer Howes), religious first-timer Wesley (who is quickly dubbed "Altar Boy" by his team), Kenney (Eric Hanson) and Caleb (Kolton Stewart), a quiet kid who doesn't use a weapon because he is a weapon. On Quinn's side is Jess (Mackenzie Munro), the only girl in the game, the dangerously unhinged Skinner (Michael Friend) and best friends Frost (Alex Cardillo) and Sikorski (Dyson Fyke). When I was a kid, there was a forest trail across the street from my house, and I can't tell you how many hours were spent crouched down in tall grass and behind trees, Entertech water gun in hand (this was in the days when they could look completely realistic as long as the front of the barrel was red), waiting to ambush my enemies. We called it "guns," but it was the same game being played by the kids in I Declare War. I was these kids. The movie gets it right. 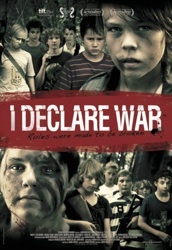 I Declare War is one of the best movie's I've seen about adolescent boys because it understands not just how they act and talk -- it understands what that age feels like. How a game of war really can seem like life or death, how you can lose yourself in the reality of make believe, how the Hell of War reveals new truths about your closest friends. It works as a spoof of war movies, with every kid standing in for a familiar archetype and familiar beats skewered by nature of the fact that they're being performed by 13-year olds. Pay attention to the cleverness of the editing, where a log switches to a bazooka in a single cut and then back a bazooka depending on whose perspective we're getting. There are lots of smaller ideas present in the movie, too, including some clever messages about gender politics that's pointed for adults while remaining honest about what it feels like to have your first crush. The movie even puts its money where its mouth is as far as religion is concerned. Watch Wesley/Altar Boy's arc -- what he does and does not do. He's one of my favorite characters. Though I don't believe the filmmakers are being deliberately political, I Declare War is also a fascinating commentary on movie violence. Sometimes, the gun battles and "deaths" are played as parodies of war movie cliches. Sometimes they're played for laughs. Sometimes, though, what we're seeing feels very transgressive -- kids shooting kids. What makes it acceptable to us as an audience is the pretext that they are just pretending; any kid that gets shot just has to freeze and count 10 "steamboats" and he'll be fine. And sometimes the kids really do hurt one another -- they throw rocks, punch and kick each other. One overzealous boy takes up torture. Seeing the kids actually get hurt can be harder to watch than the pretending. And yet it's all pretend. It's all actors being part of a movie. 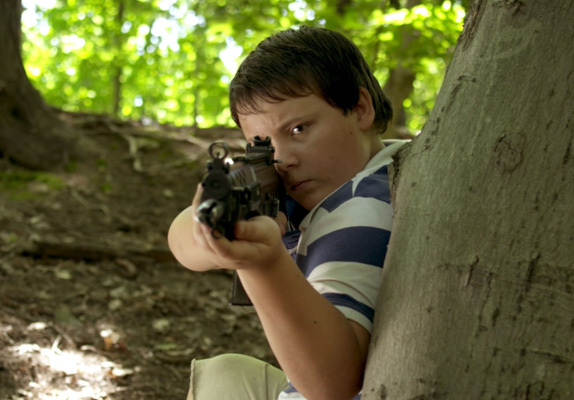 I Declare War offers up layers of violence, each designed to elicit a different response, but it's all really the same thing: kids playing make believe, whether its for one another or for the movie cameras. I'm guessing there will be some controversy when the movie is eventually released, because our current climate makes it particularly difficult to absorb images of kids shooting other kids. The movie is not unaware of this -- why else make the paint the balloons red? But I Declare War is not flip or casual about its violence. 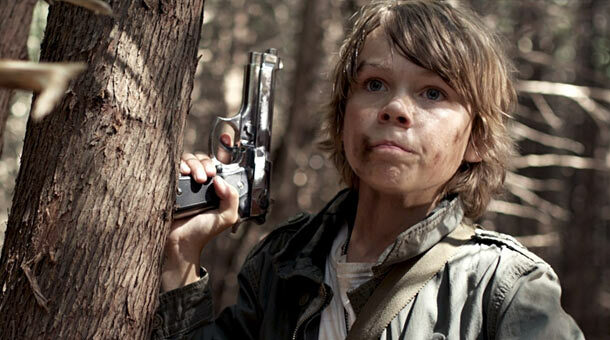 Its provocation comes from asking us to reimagine every action movie we've ever seen played out entirely by children. But first and foremost, I Declare War works as a standalone narrative. We invest in the outcome of the game. We want certain characters to win, or to "survive," or to get what they are after. The movie is endlessly surprising; just when we think we've identified which stock character a kid is standing in for, he or she is abruptly taken out. The effect is jarring and unpredictable. Anything can happen. There are emotional stakes, too -- characters' friendships and first romances are on the line, and the film is just as sensitive to those aspects as it is to the action movie aesthetics. It's enjoyable on so many levels. All of the kids in the movie are great because they all feel totally authentic. There's no self-conscious "kid" acting going on. Despite the fact that they're 13-year olds and standing in as archetypes, every kid is allowed to be more than just one thing. The ones we identify as "good" aren't entirely good; the villain is actually a really sad character with reasons for doing what he does, misguided as they may be. I loved this movie. Loved it. I Declare War is due for a limited theatrical release later this year and will mostly likely be available on VOD. Don't miss it. Of all the movies I saw at CCFF this year, it was my hands-down favorite. It's one of the best movies of 2013. Would this get a PG-13 rating on account the violence is 'pretend' even if it gets bloody (you'd know) or is the language/context such that it's an automatic 'R' or 'Unrated'? Even though many kids aren't likely to see it I'd love it if a movie depicting kids behaving like kids (not Hollywood or "movie" kids from the "Kids" or "Spring Breakers" school of movies) could be seen by an audience the same age. But that will only happen at all if it gets a PG-13, which in this day and age seems unlikely. Thanks. It's an R just for language alone, but I'm sure the images of kids killing kids (even for pretend) would make it a tough sell as a PG-13. Unless it was part of a billion-dollar franchise with studio muscle behind it, in which case it would be The Hunger Games. Except those people really do die. The system makes sense.